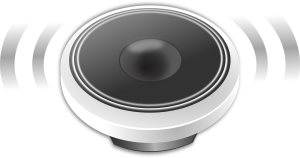 Chromebook speakers are most often pretty bad. This is true with all types of laptops. To get better audio on your Chromebook, You’ll need a set of speakers with a built-in amplifier to use them with your Chromebook or any laptop. Many new speaker systems use USB (the larger Type-A plug) to provide both power to the amplifier and pass audio to the speakers because it’s convenient and easy to set up. It is very easy to use external speakers on a Chromebook. The external speakers may connect by audio jack, USB, or by Bluetooth. Chromebooks pass audio over USB without any special issues using a standard generic driver. The speakers you use will need to have an embedded audio decoder (a sound card) to use them with Chrome. Using each of these connections methods has different pros and cons. The simplest solution may be to get Chromebook Bluetooth speakers. See more information about Bluetooth connections on a Chromebook. Below are some reviews of USB speakers for Chromebook and some speakers that will use the standard audio jack to connect. Remember that speakers using an audio jack will require batteries or a power cord. Easily access power, volume and the headphone jack on the right speaker with most of these. 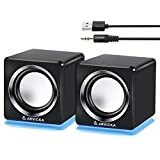 Great pair of Chromebook compatible computer speakers. Compact, low-profile design ideal for desks with limited space. These speakers use USB to give a little more power to the speakers. These sleek little stereo speakers make it simple to rock your laptop or desktop with crisp, clear sound. Get convenient controls in a compact design that fits easily on any desk and sets up in seconds. With five watts (RMS) of power, you’ll hear your music and movies loud and clear. You will need to plug these speakers into the wall. Delivers high-quality room-filling clear stereo sound with volume control perfect for workspace/ office/ RV/ study/ Dorm/ Kitchen/ any nook in a small or medium-sized space, whenever you are making video calls, having webinar or video tutorials, listening to music or audio book, playing games, watching movies or even having echo dot speak louder. These are great speakers with a little more power for a Chromebook. They will need some external power, but deliver great bass. Bluetooth speakers will work with most Chromebooks very easily. Bluetooth Chromebook speakers will need a power source (most often battery). 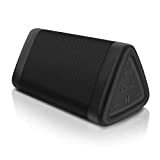 Below are some reviews of excellent Chromebook compatible Bluetooth speakers. All Chromebooks have Bluetooth capabilities, and that means products like Logitech’s Mini Boombox are a great way to extend the sound up to 30 feet away or just get better sound for whatever you’re listening to. The new OontZ Angle 3 Enhanced Stereo Edition delivers greater clarity stereo sound with clear mids and highs from dual precision acoustic stereo drivers; the bass output is enhanced by our proprietary passive bass radiator; unique triangular design and downward facing bass radiator enhance the sound quality of the music and vocals; the clarity of the sound & features distance it from the competition.